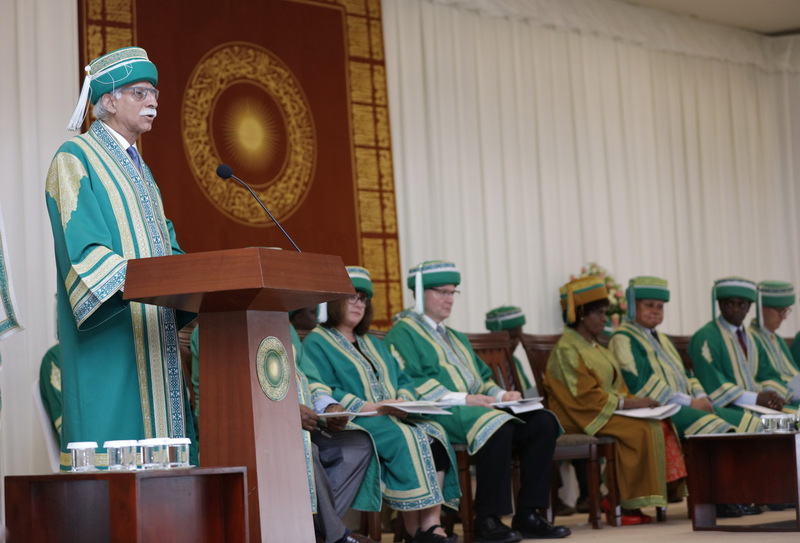 Aga Khan University President Firoz Rasul speaking at AKU’s convocation ceremony in Dar es Salaam, Tanzania. Hamjambo and Karibuni. Welcome to the 2019 Convocation ceremony of the Aga Khan University. Today, we celebrate your graduation. There is really no other day like convocation. There is so much optimism in the air. So much pride on so many faces. So much confidence in so many hearts. And, finally the day we have all been working toward has arrived. Graduands, you sit here surrounded by your family and friends, your classmates and professors, ready to receive your reward for all those long hours of study, and ready to write the next chapter in your lives and careers. An AKU education is a stern test. But it has brought out the best in you. You have the knowledge and skills; the confidence and compassion; and the capacity for leadership needed to make a difference in the lives of others. On behalf of the entire AKU community, I would like to congratulate all of you! This is a milestone in your lives. And it is also a milestone in the history of the Aga Khan University. With the graduation of this year’s class, we will have awarded more than 3,000 degrees and diplomas in East Africa. From rural clinics to Muhimbili National Hospital, your fellow alumni are providing the outstanding care people need to lead healthy and productive lives. They are elevating the quality of teaching from the pre-primary to the university level. In the Ministry of Health and the Ministry of Education, they are formulating policies to accelerate Tanzania’s development. The alumni are leading change in Dar es Salaam, Zanzibar, Arusha, Mtwara, the Southern Highlands and everywhere in between. That is truly cause for celebration. It shows that AKU graduates are indeed and I quote “a powerful light” – as our Founder and Chancellor, His Highness the Aga Khan, described them three decades ago. It is also cause for giving thanks – and there are many to whom we are grateful. Our donors, and especially our Chancellor His Highness the Aga Khan, have made extraordinary investments in this University, enabling us to provide financial support for our students’ education. Our partners are helping us to achieve new levels of impact. Our faculty and staff have dedicated themselves wholeheartedly to meeting rigorous international quality standards. And the family members of our graduands deserve special recognition. I know you made many sacrifices so your loved one could be here today. And we are humbled to be the recipient of so much generosity, trust, and dedication. We are also enormously grateful to our Chancellor for founding this university 35 years ago and for guiding its evolution ever since. We hope he is proud of the impact we are making, the services we are rendering, the quality we are achieving, the values we are upholding, and the reputation we are earning. Graduands – what an extraordinary moment this is in your lives. It is rich with possibility and full of questions. But I believe there is one question above all that confronts each of you today: And that question is how can I lead a consequential and rewarding life? I mean a life that contributes to the great tasks of overcoming disease, poverty, and ignorance. A life that empowers others to pursue their dreams. A life that calls upon all the knowledge and skills you have acquired, and challenges you to continue learning and growing. You are not alone in facing the question of how to make this a more just and prosperous world. It is one we all wrestle with. Indeed, it is one the Chancellor asked at AKU’s founding, and considered deeply with the help of eminent leaders and thinkers such as the president of the Harvard University. The answers the Chancellor elaborated form our founding vision. Today, I will ask you graduands to join me in reflecting on that vision. Because I believe it can help you to answer the all-important question: how can I make a difference? First and foremost, the Chancellor recognised that the growth and spread of knowledge drives improvements in human welfare. And he saw that this means universities, as generators of knowledge and educators of leaders, have incredible potential to change our world for the better. Yet at the time, with honoured exceptions, relatively few universities in the developing world were achieving all that they might. He concluded that what was needed was a new university deeply rooted in the developing world and devoted to meeting international standards of excellence in teaching and research. This as he just articulated was a bold vision. But the Chancellor His Highness the Aga Khan was not deterred. Today it is clear how right he was to persevere. Every day, AKU is improving quality of life for the people of Tanzania, and helping government to meet its health and education goals. Our professional development programmes have equipped nearly 3,000 Tanzanian educators and teachers with new strategies for enhancing teaching and learning, benefitting well over 100,000 students. And we are working hard to develop a new Diploma in Education to support the government’s goal of upskilling primary school teachers. In Mwanza, we are collaborating with government health facilities and fellow agencies of the Aga Khan Development Network to improve health for more than 700,000 women and children. Recently, we visited dozens of our nursing alumni across the country, including many working in the public sector, and heard how their leadership is improving the health of their communities. We spoke with a top nursing official, a nursing school principal, the director of nursing at a regional referral hospital, and many others. We heard how they have reduced hospital mortality, increased the number of women giving birth in health facilities, helped write new nursing regulations, and much more. I am pleased to report that the quality of an AKU education was confirmed by the recent news that a graduate of our Institute for Educational Development here in Dar es Salaam received Kenya’s 2018 Teacher of the Year Award. What’s more, is for the second time, an AKU alumnus has been named a finalist for the $1 million Global Teacher Prize. This is a source of great pride for us. Graduands, several principles emerge from this history with special vividness. I urge you to consider them closely. And second: Excellence Drives Impact. Rather than a luxury, excellence is a transformative force with the power to improve life for everyone. Around the world, we see efforts to stoke conflict by pitting different groups against each another. By contrast, this University has always stood for the principle that everyone deserves access to opportunity, regardless of faith, race, ethnicity, nationality, gender, or socioeconomic status. That is why, for example, we provide financial assistance to those in need – so that students from the widest possible range of backgrounds can attend AKU. Hence I urge you to focus not on that which separates one group from one another, but on our common humanity. I urge you to work across borders and boundaries of all kinds to better people’s lives, especially those of the disadvantaged. The final principle that I will mention was memorably stated by our Chancellor His Highness the Aga Khan three decades ago. That is precisely what AKU is attempting to do. And what we see is a world where the issues are large, numerous and interconnected – a world that demands a truly multidisciplinary university equal to the scale and complexity of the problems it faces. Hence, we have plans to establish a Faculty of Arts and Sciences to provide a wide-ranging undergraduate education that prepares students for leadership in multiple fields. We are educating journalists and communicators at our Graduate School of Media and Communications, the first of a number of new Graduate Professional Schools we are developing. Our East Africa Institute is delivering conversation-shaping insights on public policy issues. The Institute for Human Development is conducting research aimed at ensuring every child develops to their full potential. Our Centre of Excellence in Women and Child Health is strengthening health systems for East Africa’s most vulnerable women and children. Graduands, in a constantly evolving world, you too must endeavour to fly high and see far. You must anticipate, adapt to, and shape the course of change. As you chart your unique course in life, I encourage you to look to our founding vision for inspiration. Graduands, this is not goodbye. Today, you are joining the AKU alumni community – a network of thousands of change agents that spans the country, the region, and the world. I urge you to stay connected to your classmates and your University, and to seek out your fellow alumni for advice and collaboration. Your story is part of the University’s story, and our founding vision will find its fulfilment in your achievements. We cannot wait to see how brightly your light shines in the world today. Thank you and Asanteni sana.